As you know Elder Scrolls Online is known for high level of customization. You can see this for the first time when you create your character. But ESO developers’ team doesn’t want to stop. They are making the game more and more interesting to play adding new features. They are listening to the community and react. A lot of players were asking to add Armor Dyes and developers also decided that such feature will be amazing. So welcome guys – Armor Dyes system will be added in the next patch in August. Some of you may not know about the role of dyeing. So let me tell you some basic information first. When you find or craft a piece of armor it always has the same default colors. That means the same armor pieces will look identically on you and your friend (or other player). If you both put on the same gear you will have the same appearance. Gear Dyes allow you to change the color of your armor to make it unique. First of all you need to find a special dye station. Usually this station is located not far from other crafting stations and is relatively easy to find. This station allows you to access special Dyeing interface. The list of all available dyes is on the right and your gear is on the left. 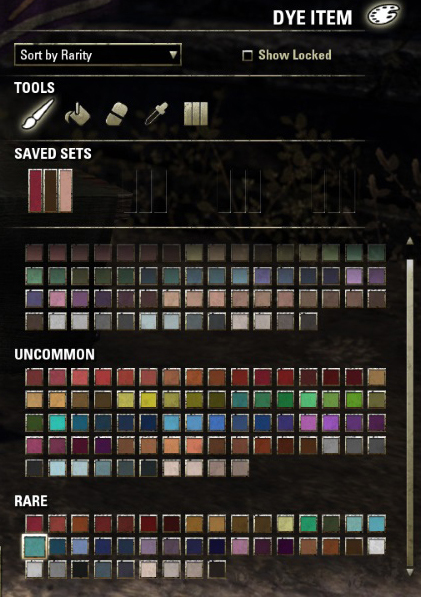 When I saw this interface for the first time I was impressed with the number of available colors: there are 59 Common Dyes, 74 Uncommon and 40 Rare. 174 colors in total! Each piece of gear has 3 “slots” for colors, meaning you can apply up to 3 colors to each item: primary color, accent color, and trim color. Taking this into account you can create a lot of different colors for your gear. You can also “Save” your color sets in order to apply them fast to new items in future. There are 174 colors and it may be difficult to remember the combination you used for your armor a week ago. The “Save” feature will help you to keep the combinations you like and use them fast. All colors are locked in the beginning and you can’t use them. You need to unlock them first. The system is pretty simple – all colors are tied to achievements. When you get new achievement you unlock new color. The greatest thing is that this color stays with your character forever and you can use it whenever you want. Developers don’t want us to grind for special items every time we want to change color of our gear. So if you want to unlock a color you need to get the corresponding achievement. More than 40 new achievements were added to make this system more rewarding. All players can have access to all colors in the game. Moreover, you are not required to reach 50th level in order to be able to change color of your gear. The achievements are spread throughout the game and you can unlock your first colors at low levels. Of course you will have to reach the level cap in order to unlock all colors, but it’s a really challenging task. In general all colors are thematically related to their achievement. For example when you become a member of Mages Guild you unlock blue color that Mages Guild members wear. As you see the system is very interesting and allows you to create unique style for your character. You can customize color of your armor as you like. Nice Article, Ambuaz. These dyes are going to be a fun addition to ESO, and i am really glad that once you unlock a dye on one of your characters it will be available to your alternate characters too. That is, the dye colours you unlock are tied to your account, and not just to one character. :D That makes it more worthwhile for me! Luv it!